I just want to start out by saying that it’s ironic of me to write a blog post about eco-friendly food right now because I’m waiting at the Toronto airport to fly home to California for reading week. Flying is pretty much the furthest you can go from eco friendly. I guess I didn’t think of that when I decided to be an international student. I wish solar powered teleportation was real but it’s not the year 2300 so I guess this is my only option to get home. 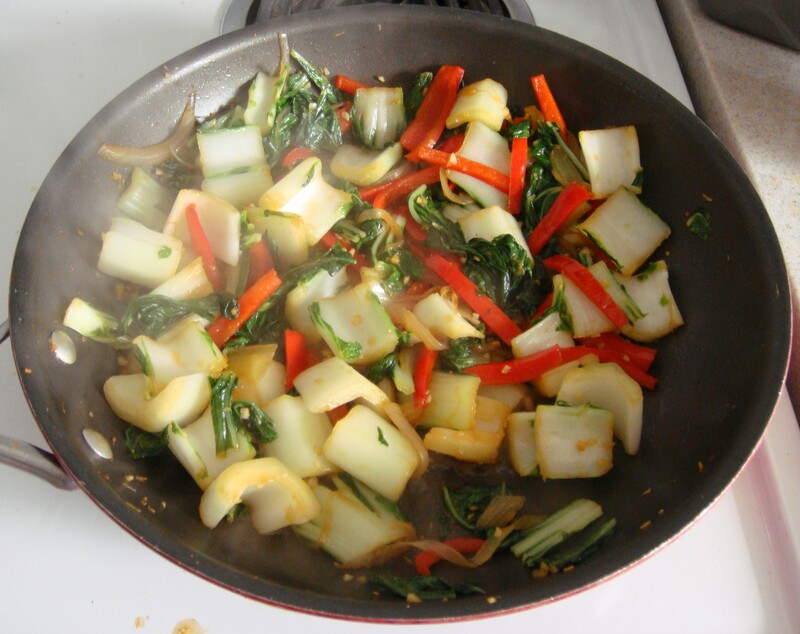 This stir fry is an easy, healthy thing to make if you’re in a hurry. I like to cook a bunch of rice at once and keep it in a pot in the fridge to serve with stir fried vegetables and curry (like this). I pack leftovers in small jars (peanut butter jars are the perfect size for a lunch portion) and bring them with me for lunch. Heat oil over medium heat. 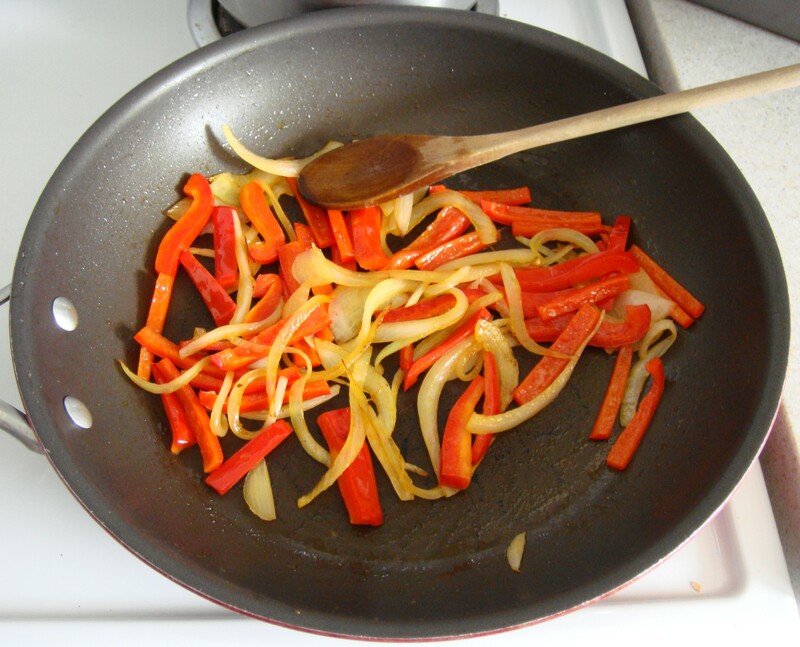 Add onion and bell pepper. Cook until softened, 5-7 minutes. Add garlic, ginger and cayenne. Stir for one minute. 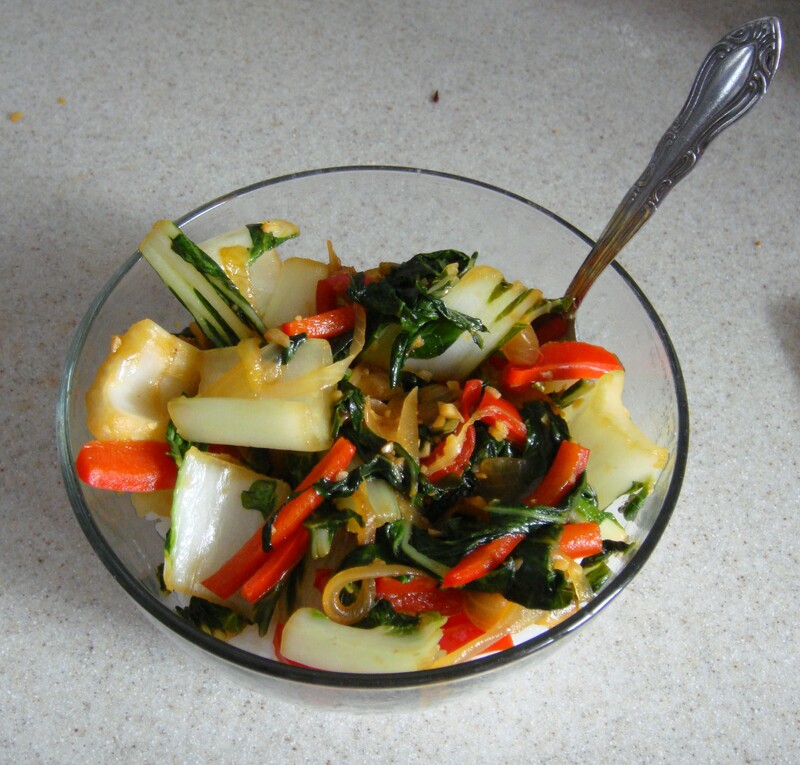 Add bok choy and soy sauce. 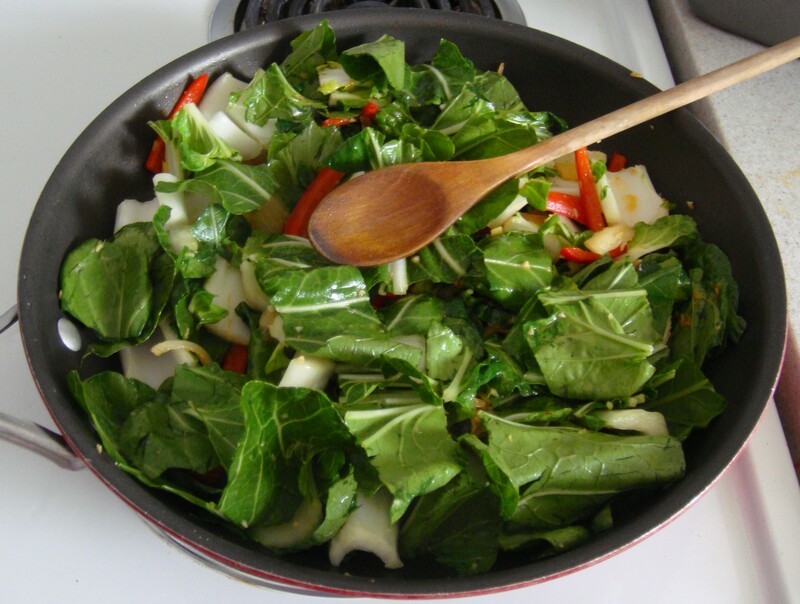 Cook for about 5 more minutes, or until bok choy is wilted. Cayenne – I buy spices in bulk at the health food store. It happens to be cheaper than buying them in plastic containers at the regular grocery store. Soy sauce – This is in a glass bottle. I think some stores may sell soy sauce in bulk, but not that I’ve seen in Guelph. 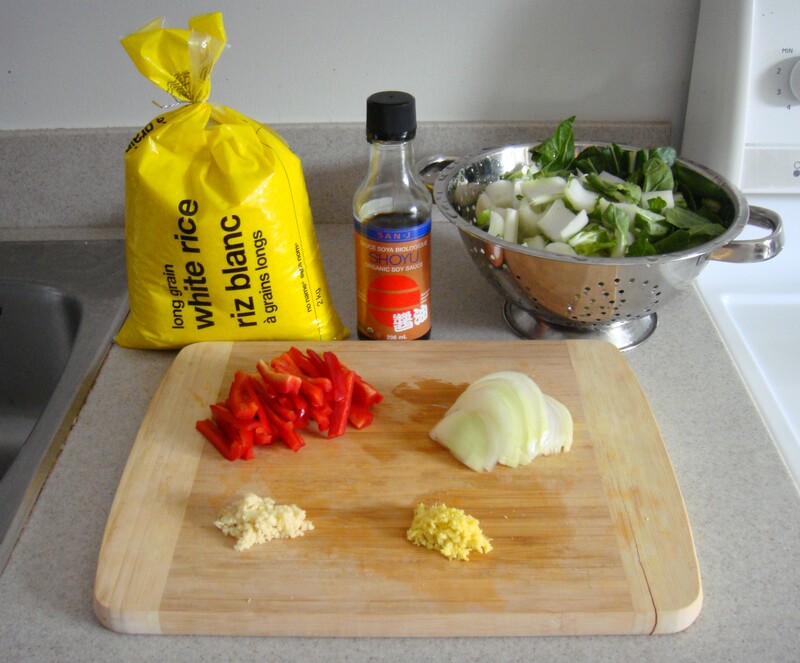 Rice – I buy rice in two kilogram plastic bags. Bulk rice is a lot more expensive. By buying things in bigger plastic packages, however, you end up producing less waste altogether. It’s usually a better deal as well. Cooking oil – Another thing in a glass bottle. I know some stores sell oils in bulk. I haven’t seen that in Guelph though. Note: I don’t recommend using Teflon! Teflon pans release toxic gases when heated. The frying pan in the pictures is my housemate’s pan and it’s the only large frying pan in my house so I use it occasionally. Another problem with Teflon is that the pans don’t last that long – they get scratched up really quickly and need to be replaced. I’m going to get a metal one eventually, but they’re expensive so I’ll have to wait on that one. By the way, a similar chemical coating is on the inside of microwaveable popcorn bags. Click the link to learn how to make cheaper, healthier popcorn from bulk popcorn kernels. So glad to see you back. I had wondered if Guelph might be a big challenge for a “California girl.” I appreciate your gentle nudges to a better way of cooking and living.